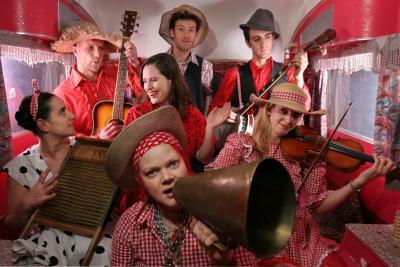 Anarchist Hillbilly Barn Dance Shenanigans with this troupe of musicians, charismatic callers and gingham-clad dancers. Strip the Willow, Do Si Do, swing yer partner and have a good ol' foot stompin' dance. Whether it's self produced events across London, or on festival stages, we're sure to get you up and dancin'!